Jon Ball and Sir Nicholas Soames MP presented two local charities with cheques totalling over £6,000 from the proceeds of last year’s Broadway Sound Music Festival. Time 4 Children is a charity which aims to increase the emotional wellbeing, self-confidence and self-esteem of emotionally vulnerable children between the ages of 4 and 12 in the Mid Sussex area. Group B Strep Support is a Haywards Heath based baby charity, working to stop life-threatening group B Strep infection in new-born babies. Group B Strep is the most common cause of serious infection in new-born babies, causing sepsis, meningitis and pneumonia. 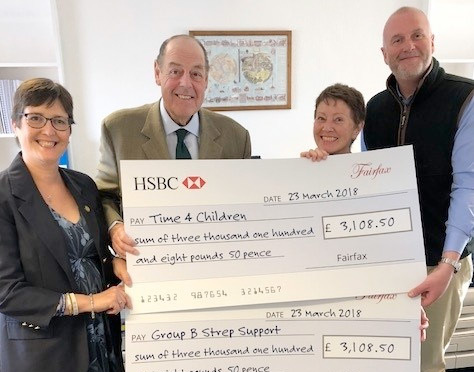 Each charity was presented with a cheque for £3108.50 on Friday 23rd March 2018 and Fairfax will continue to work to support both charities and the work they do.